Gary Vaynerchuck doesn’t just love a good glass of wine. He also loves a good T-Shirt. 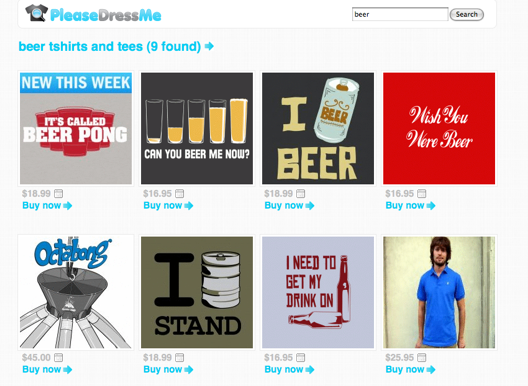 The video blogger behind Wine Library TV has just launched a T-Shirt search engine called PleaseDressMe with his brother AJ and Digg lead architect Joe Stump. The site is simple. It lets you search for T-shirts by keyword, tags, color, or price, and returns results from places like Threadless and BustedTees. It is not trying to search all T-shirt sites, just the cool ones. I’m not going to harsh on this site too much because, well, it’s a T-shirt search engine. And it’s just a side project. But many keyword searches I tried turned up nothing. (Come on, Gary, you couldn’t find any “wine” T-shirts?). I did find “beer,” though. I’d suggest using the tag cloud to find what you are looking for, until the site crawls for more Ts.